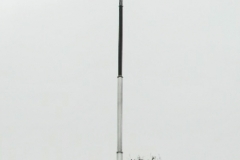 The NY Series of telescopic Hilomast masts has a base section diameter of 9.3″ and is pneumatically operated by custom-built air compressors. The NY Series does not have standard locking collars. Locking collars are available at an additional cost. The NY Series has special engaging screws, fitted into each of the main collars in order to resist the torsional loads when the masts are fully extended. The NY Series has a horizontal flange of 6.1″ diameter at the top for mounting antennas, etc. This flange can be drilled to suit customer requirements. Hilomast, LLC also offers custom-built applications with all of the masts in all of our series. Please feel free to contact Hilomast from our “Contact” page of this website, or call Hilomast, (386) 668-6784, and we will be glad to discuss details and/or options on the NY Series or on other competitive products in which we specialize. Note: The table of masts below is only a small selection of possible mast configurations available to you. Due to the modular design of all Hilomast pneumatic masts, we are able to offer masts in custom sizes, with or without locking collars, and in various colors and finishes. The table shows the vertical head load that each mast will support and the maximum operational wind speed. The weight of the antenna, however, is not usually the main criterion when selecting a mast. The limiting factor is usually the ‘side surface area’ of the antenna. NH Masts = 1 ft². NK = 1.5 ft². NL = 2.1 ft². NX = 3.2 ft². NY = 11.8 ft².